This large and imposing winged gargoyle beast motionlessly perches on guard clenching a rooftop cathedral corner globe. His eyes set in an intense stare… he knows of fate and at all cost he will stare down evil for your protection and allow you to dwell in your refuge from all that is bad. Our undeniably and unique Guardian of the Future is a wonderful example of medieval beasts and is hand cast in the USA (yes the USA!) of a plaster resin which gives this creature a nice weight. The grey stone finish is hand applied. 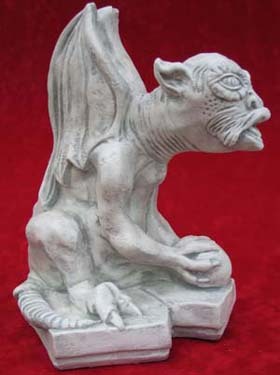 12" H x 8-1/4" W x 10-12" D. Each Guardian of the Future Gargoyle is cast and hand finished in the USA - we have a limited number so order now before they are gone.